So why is this happening? I think that as technology expands and our kids are exposed to more and more new things, parents get more anxious. They want to protect their children from harm, which of course is their responsibility. I think there are also parents who are perfectionists—in their eyes, the child never quite does things the way they would do them, so they take over and do it for the child so it will be done “the right way.” And of course, there are parents whose children have emotionally blackmailed them so much that they are too exhausted to ask the child to fix something on their own. Whatever the reason, it’s vital that we get children accustomed to fixing their own problems and taking care of their own responsibilities because let’s face it— you simply will not be able to fix their problems forever. When parents don’t hold children accountable to meeting their responsibilities, a couple things happen. 1. If you tell your child to “clean this up,” (for example) and then you eventually do it for them, then what you say starts to mean absolutely nothing to your child. Your authority begins to diminish. 2. All those excuses you make to justify “fixing” things for your child? Your child begins to internalize them. They become a part of who he thinks he is, and he will use those same excuses to avoid accountability at school, and later on when it’s time to find a job. Why Do Parents Fall into the “Fix-it” Trap? There could be many reasons why parents might fall into this pattern of doing for their children what they can really do on their own. Let’s take a closer look at some of the main reasons. Pity or guilt. Perhaps your child is adopted, your ex is a dead-beat parent, you have a relative who is ill, or there has been loss, divorce, or trauma in the family. Or maybe your child has a learning disability or has trouble fitting in with peers and making friends at school. These are all situations in which parents might feel guilt or pity for the child. One way parents deal with that guilt or pity is to take on some of the child’s responsibility as their own so their child can feel less burdened or cope with their challenges more easily.Children who are experiencing hardship need structure and they need to be taught coping skills and functional skills perhaps even more than your “average” child. Hardships will only cripple your child if you treat your child like he can’t handle them. It’s important that you let your child know you believe they are strong and resilient by maintaining your expectations because you are the mirror that will impact your child more than any other. The image of them that you reflect is what you will get back. Parental anxiety. Some parents simply struggle emotionally with seeing their child feel uncomfortable. It’s a very parallel process: The child struggles and feels miserable, and in turn you struggle emotionally and feel miserable as well. In order to avoid these uncomfortable feelings, many parents will step in and take over for their child. They feel better, breathing a sigh of relief at having avoided this huge emotional burden for themselves. But the child misses out on an opportunity to practice valuable life skills and coping techniques. When you step in and “fix” things for your child because you want to avoid your own difficult emotions, you are robbing your child of a growth opportunity which may never come again. In order for children to learn how to do hard things, you have to let them go through hard times. There is no way to truly master something without experiencing it. Your child has trained you. An acting-out child’s favorite parent training tool is emotional blackmail. This happens when you say “no” to your child or tell your child to do something he doesn’t want to do. Their attempts to get their way by whining and pleading turn into crying, screaming, throwing things, or worse. James Lehman calls this “One-way Training.” Parents all over the world walk on eggshells around their acting out children, doing much more for them than they really should in order to avoid the next apocalyptic explosion. After all, their child acts like unloading the dishwasher really is, in fact, the end of the world.But, “fixing” things and doing things for your child in this case comes with the highest price tag of all. Not only are you sending your child the message that you don’t think he can meet his responsibilities, but you are also sending him the message that you don’t believe he can learn to control his emotions. Your acting-out child will learn to use this intimidation, bullying, and abusive behavior in other settings and in other relationships as he grows older, if left unchecked. Positive Self-talk. Ask yourself who is really benefitting and what’s in your child’s best interests—“What does my child really need, and how can I make that happen?” Your thoughts have a huge influence on your behavior and your body’s response to a challenging situation. If you change your thoughts, you can change your behavior and calm yourself down. Tell yourself, “I can handle this. My child is his own person and not a direct reflection of me. I am strong and can make good choices for my child,” etc. These positive statements can help prevent you from doing something for your child that he can really do on his own. Distraction. If the self-talk isn’t enough, find a mental distraction. Get involved in another activity like cleaning, reading, going for a walk, knitting, or just talk to your partner, friend, or relative to vent and collect your thoughts. Stop and think about what will happen if you don’t fix something. Most likely the sun will come up tomorrow, and it will be okay. Hold your child accountable. Let your child know what you expect of him and then restrict a privilege until that task is done. For example, you might tell your son you expect him to make amends to his sister for calling her names this morning, and that he won’t be able to use his skateboard until he can show that he has done that. Or, you might tell your daughter that she needs to work on her science fair project for 30 minutes each night and she won’t be able to use the computer until that time is up. If this is something new for you and your child, let your child know about these changes ahead of time so he can make an informed decision when it’s time for him to make a good choice. Give hurdle help and coaching. There will often be times when children just don’t know where to start or they feel too overwhelmed by how much they have to do. Or, they might not know what they need to do exactly. So you do need to be involved, but don’t do for them what they can do on their own. You can help them figure out where to start, how to break the project up into smaller bits, how to get help from the teacher if they are confused. But don’t do the research for them, don’t ask the teacher for them, and don’t type it, glue it, or decorate it for them! Put down the laptop, and back away. Your child will not learn how to type 70 words per minute like you unless you let them hen-peck at 15 words per minute for a while, just like you did when you first learned. So help them figure out the steps, the tools, the techniques, but let them do the work. Your only job is to coach and hold them accountable for the work. Allow your child to be his own person. Your child may begin to show preferences or tastes that are very different from yours, and at a very young age. Don’t try to force your interests on your child. If your child wants to choose a poster board color that you hate, or you don’t like the way she sets up the board for her class project, stand down. As long as the requirements the teacher has established have been met, let your child have the creative freedom to set it up as she chooses. Know that there will be times when you do hold your child accountable, but they still won’t do what you want them to do right away. If you have given task-oriented consequences and coached them, then that’s the best you can do. Your child will sometimes choose to fail—often to spite you if they feel you pushing them too hard. If you recognize that you’re doing too much for your child or trying to “fix” things on a regular basis, be aware that continuing to do so may prevent your child from learning adequate problem-solving skills to manage time, take orders from superiors, or cope with unpredictable stressors or unpleasant life situations. Picture what you really want your child’s future to be like and then imagine the complete opposite of that. If you do too much and fix too much, you may actually be steering your child in the other direction. That could also mean that you have a child who is too dependent on you. Children like that often grow into adults that are too dependent on their parents. 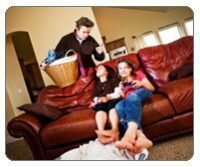 Overly-dependent adult children often drain their parents’ energy, resources, and time at a point when the parents’ job should be done and they should be enjoying the fruits of their labor. Start handing some responsibility back to your child today so that he can start learning how to deal with this crazy thing called life. You’ll both be better off in the long-run.